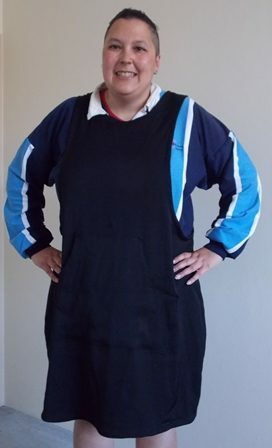 Well I am happy to say that I have gotten a lot of the pieces made including making 2 York’s as I really liked the pattern and I have made all the patterns from A Beginner’s Guide to Sewing Knitted Fabric. Some of the items do need tweaking just because of the fit and I am having issues with my curved shoulders (too much computer work) I was able to use up a lot of fabric from my stash making the different pieces which was good but saying that I kept adding to my stash at the same time! I still have the remaining skirts from A Beginner’s Guide To Making Skirts as I haven’t gotten to those yet. I now have 3 undie patterns that I want to try, I have so many knit scraps left that I really just want to use them up on undies. The Calista is still something I would like to try but I have also found another bra pattern which looks kind of easy so will try that too. The Appleton dress is what I want to make for Frocktails so I need to get in and start sewing that. The Robbie pants are just something I saw this past weekend, a friend has made them few times and she looks fabulous in them so I thought I would give them a try. Prior to the lasted Dr Who this year I was wanting a long hoodie/cardigan/jacket but after watching the series I have really fallen in love with her jacket. I want to make something similar but in black. In my mind I can see a long hoodie type cardigan that does up with a zip, I haven’t got a pattern yet but I haven’t seriously looked around for anything yet either. As mentioned for the pieces from my last list I was able to use up a lot of fabric from my stash, particularly when making the pieces from A Beginner’s Guide To Knitted Fabrics where I used fabrics that I wasn’t sure how else I would use them such as white fabrics. Since my last list I have been adding to my stash. Over this past few days I have ordered another 6 metres of fabric alone, it was on sale and hopefully can be used for 2 of the items on my new list. Now I am a bit more picky on how much I buy and try to buy with a purpose in mind. I raided my stash to find fabric for my Appleton dress so I will use the black/white daisy fabric. 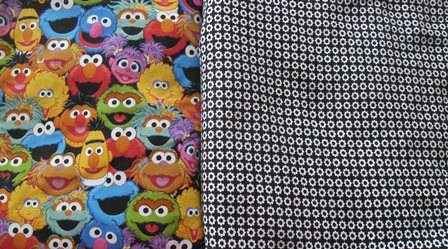 The Sesame Street fabric is newly acquired, it will probably be another Turner skirt but with the faces only on the front and a plain black back. I wasn’t able to buy enough to make a full turner skirt so will team it up with black fabric from my stash. There is no pressure on myself to get all my items made. I’m just going to make myself clothing when I am in the mood. 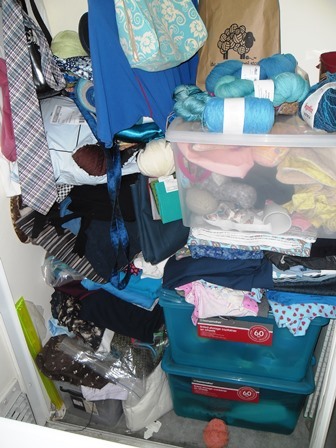 The built in wardrobe where I store the majority of my dress fabric and yarn has been bugging me for a while, it had gotten way out of control. I’d get something new and just dump it in there. At times I’d move one thing and everything would fall out. I had some non craft stuff hanging in there and the big white box is my finished gift box. At times this had so much stuff on it I wouldn’t even bother trying to get in it I would just put the next finished gift on top… I know what is the point of having the box then if I can’t get to it. Something had to be done as it was making going into the cupboard not fun. 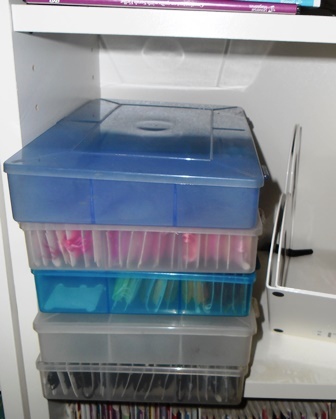 Recently in a facebook yarn group someone showed a picture of some new storage boxes that Kmart has that are stackable and flip open at the side so you don’t have to remove the lids to access the contents. Yesterday I measured my space after checking out the dimensions online and today I picked up 3 containers. I cleared out everything from the side space and the containers fit perfect. The bottom one has all my cottons that I use for dishcloths. The middle one has WIRES yarns as they are all 100% wool. The top one is my everything else yarn. There are half a dozen cottons in there but they will be made into a scarf. I’m currently venturing into new different types of yarns so they are all in there. 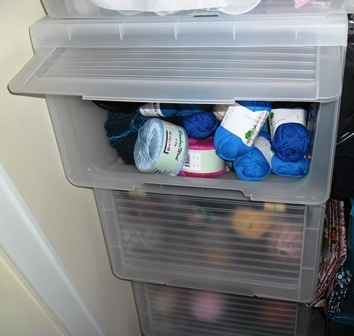 If I run out of space in there I can’t buy more yarn so an incentive to start knitting and crocheting! As I moving my fabrics about I was looking at each one and thinking if realistically I would use it or not. I culled a lot of fabric from my stash. 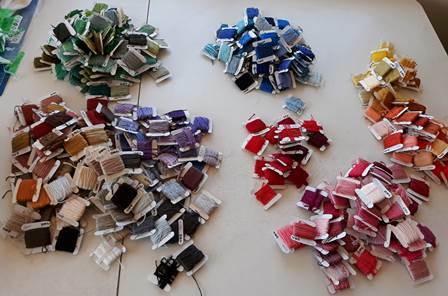 In October Sydney Spoolette’s are having our Spring Fabric Swap day and this lot will taken to that. Some of it is offcuts that I know I won’t use again. Some of it is fabric I purchased new but it isn’t screaming make me into something. Some of it I have brought second hand or gotten at previous swap days. There is no point of it sitting in my wardrobe when it might be perfect for someone else. I noticed as I was sorting through was I had a lot of things in plastic bags. I only have one thing in a bag now and that is a set to make a tank top everything else I took out of the bags. These bags will now be sent back to my local supermarket tonight for recycling. I think I am less likely to use it if it still in the bag. Another thing I have to remind myself just because it is blue doesn’t mean it has to come home with me. I have both some yarn and fabric that I don’t really need and I know the only reason I’d gotten it was due to the colour. The wardrobe is better now. I culled some other non craft stuff from it. I’ll be honest and say it is not ideal but for the time it will do. 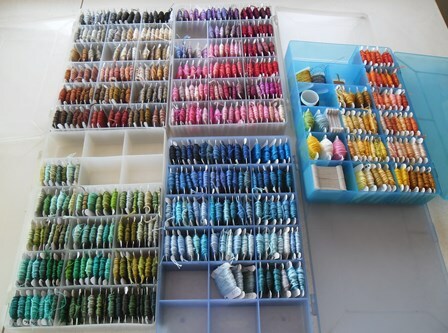 I basically have the fabric stacked in the open container that used to have the WIRES wool in it. On the other side of the room I do have some fabrics in containers but I don’t really want to put the fabrics in containers in here as I know I will never bother to go into them. The fabrics I do have in containers are really specific like fleece or felt. 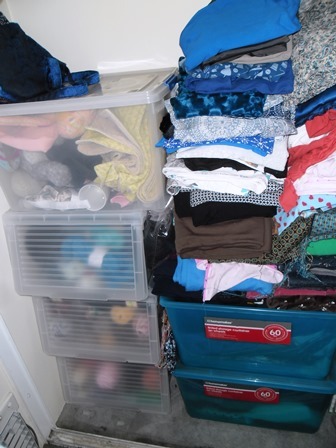 All the stuff in here is dress fabrics – some knits, some wovens, some heavier fabrics. 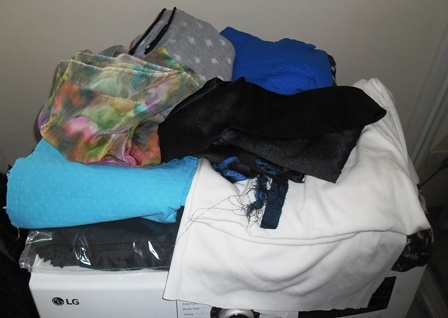 If I am going to make clothing this is the pile I am going to head too. I can still access it all in here. Maybe I might look to see at some point if I can fit some narrow shelving or something in there but for the time being this will work. Now I just need to get my sewjo back and start sewing again! I need a bag at work to keep some supplies in so I can store them neatly in a cupboard and not have to carry them everywhere each day. 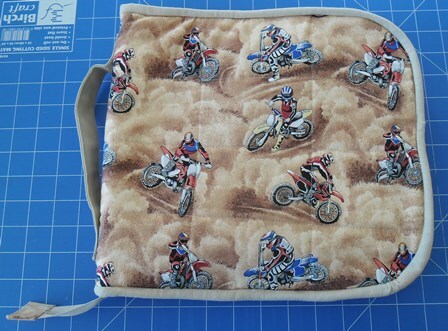 No problem I can sew I’ll just whip up a bag that closes up and I can use it as a project bag after I finish needing it for work. Friday afternoon I came home, prepped some fabric, found a pattern I was going to have to modify but was still larger than I was wanting but would do the job. This morning I was ready to cut the fabric and thought STOP!!! Think about it can you use a different pattern or.. even use an existing bag to do the same job. 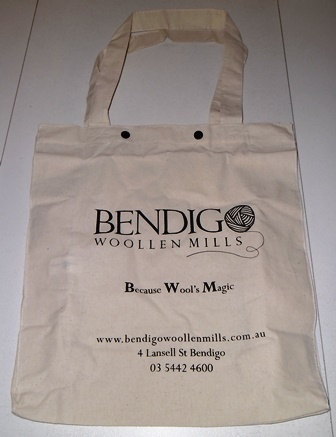 By chance I found this Bendigo Woollen Mills tote bag in my stash this morning which came as part of a kit I brought earlier this year. 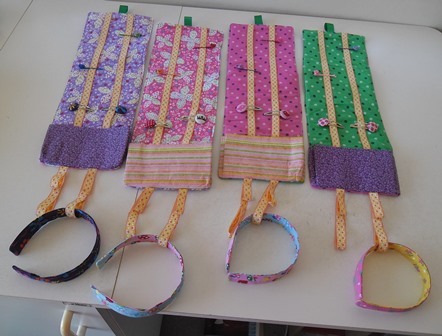 When I found it I thought ‘this sitting in bag in plastic is just a waste you should use it some time’ The sides expand so I thought I might even use it to form a pattern to make some reusable shopping bags which I am planning on making. 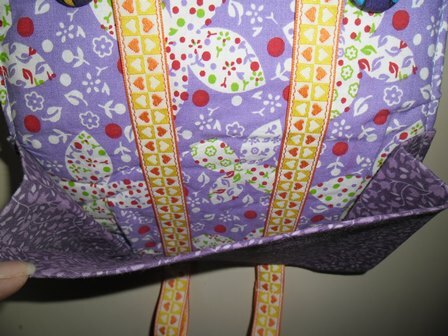 When I went to cut my fabric I remembered this tote bag and thought it is a great size but it doesn’t stay closed. Brainwave by adding a couple of kam snaps to the top of the bag instantly the bag had closures. In my stash I found some black snaps which matched the print on the front of the bag so you can’t tell that I added them myself (not that it matters) 5 minutes later I had a bag that would stay closed, would fit an A4 notebook in it plus a few other goodies (coffee cup, glasses, teabags) Next year when I don’t need it for work it will be a yarn bag again. As crafters I think we tend to over think things sometimes and create more work for ourselves then we need to just because we have the skills to do so. 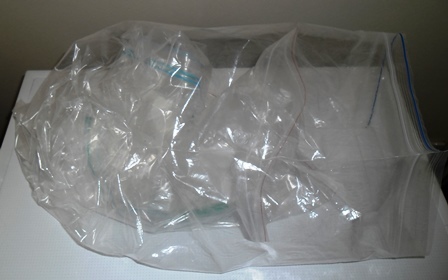 If I had made the bag I originally had thought of doing it would’ve taken me hours, it would’ve been a good bag but there were other more simple solutions that I didn’t think of because my immediate first thought was make one. I never even considered modifying an existing bag. This is also a reason why it pays to know what you have and if you get something like a useful tote bag don’t stash it away use it or why bother getting it in the first place. At times we need to Keep It Simple and think outside the square for solutions. We are all time poor as crafters so why create more work for yourself when your time can be better spent on other projects. Last year I brought myself a Boye electronic yarn winder. Until recently it had been sitting under my bed unopened. I had to frog back a crochet project so I decided to break it out of the box to re-wind the ball. 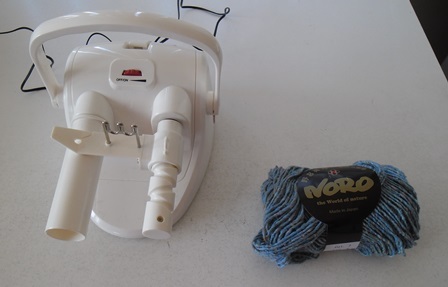 So as the name suggests this plugs into the wall and does all the manual winding of the yarn to create the yarn cake for you. I found this great YouTube clip on how to use it. 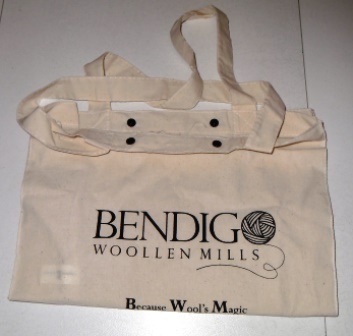 I first tried it out on the ball of Bendigo Woollen Mills Cotton I was frogging back. 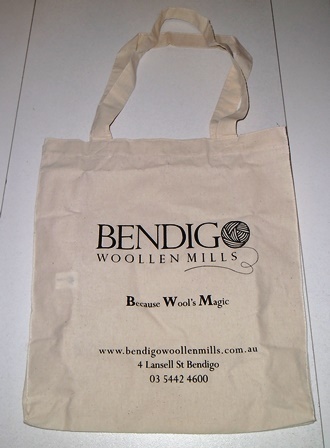 Bendigo Woollen Mills balls / skeins are 200g so they are quite large. It did handle it but towards the end it struggled as the yarn cake got larger and larger. The machine slowed down and I had to help it a bit. I put a photo up online and a friend commented that cotton can be hard to work into a ball. In the end I decided to cut the yarn and make a second cake. I haven’t weighed the yarns to see how much is in each cake. A yarn cake is the description given to balls of yarn when they are wound like this. 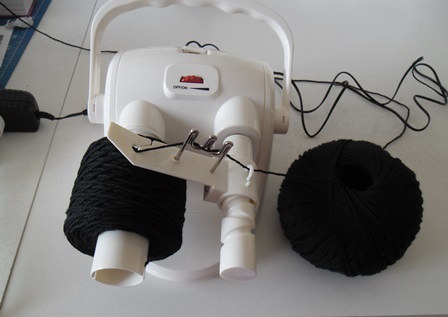 They allow you to use the centre pull method when your working with your yarn so the ball / cake doesn’t go jumping around the table. I did use the large cake for a project after this and to be perfectly honest I wasn’t a fan of the centre pull method on such a large ball. The yarn is taken from the inside of the ball out. The cake is starting to collapse and I kept getting yarn spurts where entire chunks were coming out. I’m not sure if it was due to the size of the cake. I guess next time I use one I will see. The second lot of yarn I tried out was smaller 50g ball. It was a cotton mixture. The machine easily made it into a cake without effort. It took a matter of minutes to wind it into the cake shape. 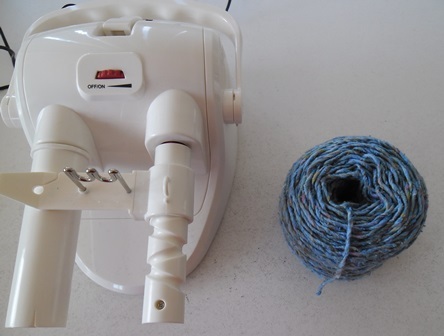 I used this cake on my yarn spindle using the regular method of using the yarn from the outside and I had no trouble with it all. Now that I know the machine isn’t as scary as it looks I’m going to be using it more. The machine is easy to use. 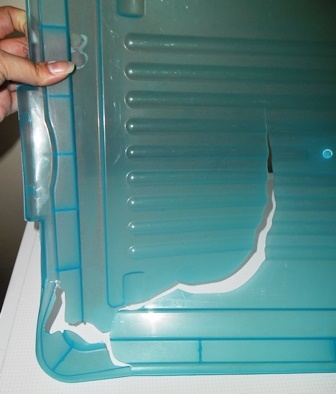 I had it placed on my cutting table and it suctioned on well to it and didn’t move (there is a giant suction cap on the underside of it) I want to make all my skeins into cakes now. I’m going to try it again on the cotton. 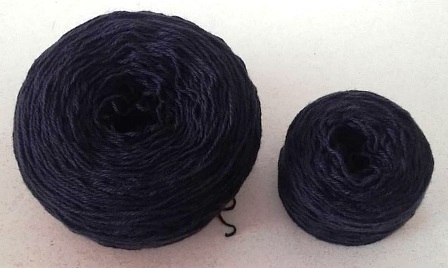 I might make a project with the smaller black cotton cake to see how it goes with the centre pull method. I like the flatter shape that the yarn cake has. It would be great for stacking your yarn if that is how you store your stuff. I found this great hair accessories pattern in One Thimble Issue 12 and thought it would be perfect to make as gifts this year so I added it to my ideas list. I had 4 girls I thought this would be perfect for so I cut all the fabric out and made one of my “kits” containing all the fabric and notions that I needed for the project. 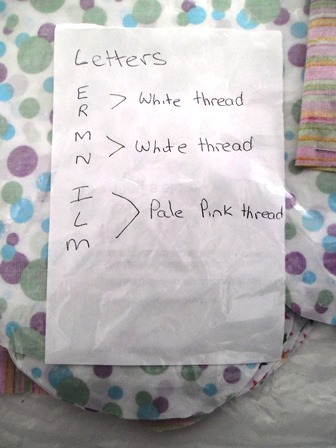 Although there are 4 each one is slightly different so I noted down the fabric combination for each child. When it came to sewing I thought why make 1 when you can make 2 so started and on them and then thought why make 2 when you can make 4 and stitched the 4 of them up a once. It might seem tiresome and you would think it would take longer but I think it was actually much quicker. You use the same equipment on each one so you only need to take out that equipment once. Your brain in remembering each step in the process and how your actually doing it (even if you are following a pattern) so you don’t have to re-think back. At your sewing machine you only need to change your stitch length once for the same step you do on all 4 so it does make sense to batch sew if you can. The front and back fabrics for these I got last year from a sewing magazine. They are fun and pretty but not childish so as the child grows and feels they are a grown up (even though they may only be 8 or 9) they don’t feel they have something babyish in their rooms. For the long lengths of ribbons that run down the front of each the pattern called for gross grain ribbon which I didn’t have large amounts in my stash but what I did have was a large roll of jacquard ribbon so I used that, the tiny hearts on it are so sweet. 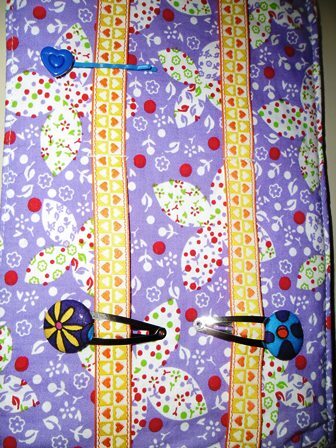 The ribbon is stitched down in sections so you can hold large amounts of clips in each of the lengths of ribbon. The organiser has a pocket to hold all the hair ties that you can’t clip on to the ribbon. It expands out so you can fit a lot of hair ties in there and we know little girls have heaps. At the bottom are hanging loops that you can place headbands in. Headbands never really went out of fashion but I think they are becoming popular again. 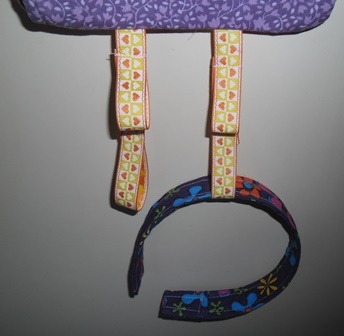 This organiser makes a great gift, it is an all one hair station to keep all hair accessories in one spot. You could make it for a child of any age. Like any homemade gift you can personalise the fabrics to suit the child. The pattern has some embellishment on the top where the hanging loop is but I didn’t bother, I left more space for clips. On each gift I added the clips and bobby pins I made and of course a headband. I think the girls would like it. My inner 9 year old would like it so I think they will too. My 2017 gifts are organised. I have already finished my first gift for 2017 as it is due at the start of January. I have sat down and worked out every gift I am making for both birthdays and Christmas for each person. Pattern wise I need to finalise a few things but at least I know what I am looking for. When making my gifts this year I realised it worked better when I had things already cut out and ready to go, kind of like kits that you buy at the shops or craft shows. Why are kits so popular in the shops? Because everything you need to make item is right there in front of you ready to go. I have spent most of my Christmas holidays making up kits for as many gifts as possible so I can just grab and sew them throughout the year. When I go to my Sewing Guild meetings I’m often stumped as to what I will work on that day but by having things in kits I can easily see what I items I can work on. I have certain projects I like doing on certain sewing machines. Anything that has a lot of curves to it I only like doing on my big machine as it has the knee lift. 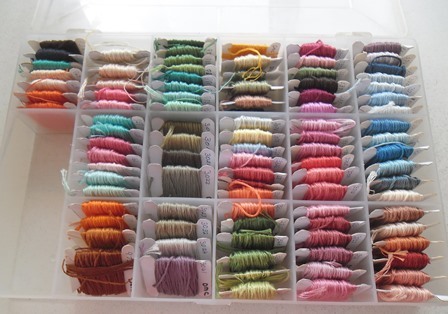 I have added notes to some of them such as what colour thread to use if I had multiple coloured items in a packet. On others I have written the way I want the fabric to be used in the project. Making up the bags was a great way to go through my fabric stash as I pulled out all the fabrics I needed from it for the required projects. It made me really look at the fabrics and think of creative ways to use them. 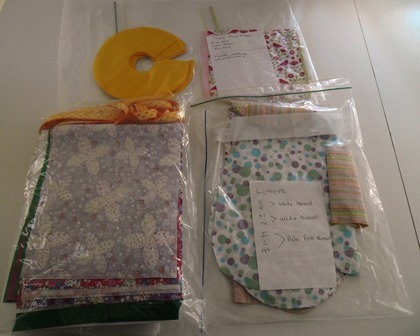 In the kits I have included the interfacing they require. 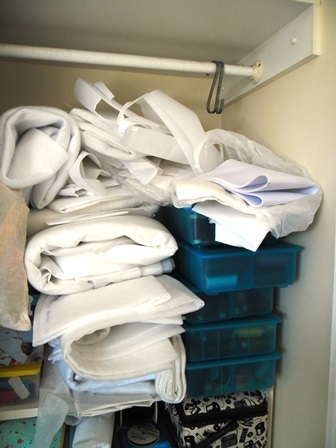 It was a chance for me to pull out my entire interfacing stash and sort it out. I now know what I had plenty of and what I was running low on. It was a real eye opener as I didn’t realise how much I had in my stash. 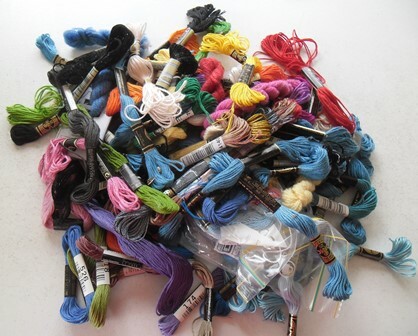 I was able to use a heap of odd shape and small pieces in projects which has culled the stash a lot. I am now feeling the most organised about my gifts I have ever felt. 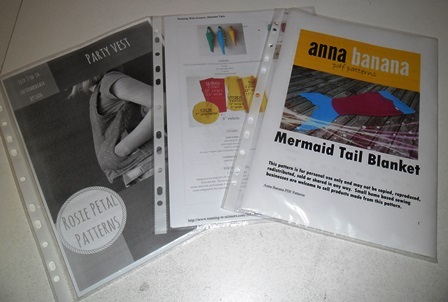 I’m going to be trying to some new patterns and some old favourites. Some gifts are going to be more complicated than others but if I just do one stitch at a time I will get them all done with love as I always do.